The ultimate goal is to provide the customer with a comprehensive and effortless experience. Our fleet of private jets is ready to transport you in luxury to and from anywhere in the world. ExcelAire's turnkey aircraft management program handles all day-to-day maintenance. At Hawthorne Global Aviation Services, quality and safety are always our priority. Hawthorne Global Aviation Services is a world class aviation services company and leader in general aviation services and aircraft management. Providing first class FBO services, tailored charter solutions, turnkey aircraft management and FAA approved aircraft maintenance, Hawthorne can accommodate all of your aviation needs. The twin pillars of our philosophy consist of unsurpassed service and uncompromising safety. At our well-appointed facilities expect to find an exceptional passenger experience and the consistency, capability and reliability that exceeds expectations. 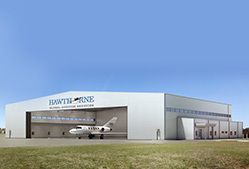 Hawthorne Global Aviation Services at Long Island MacArthur Airport (KISP) is building 31,800 sq ft of hangar and office space, available by the end of 2019!